It has come to a point now that to be called a ‘creationist’ is a big negative, like you are a pseudo-scientist, or follower of astrology, or witch doctors, etc. Such a person is thinking irrationally and cannot be trusted according to the new paradigm. That means they, in fact, expected febrile convulsions to be triggered by their vaccine in one in every 1000 children. That was the definition for ‘safe’ at that time for that particular vaccine. Like any drug, vaccines are not without risks and that has been acknowledged.7 So it is healthy to question the science, and or the limitations of its application, especially when small children are involved. Many times we have been told something was good for us, even good for our health. 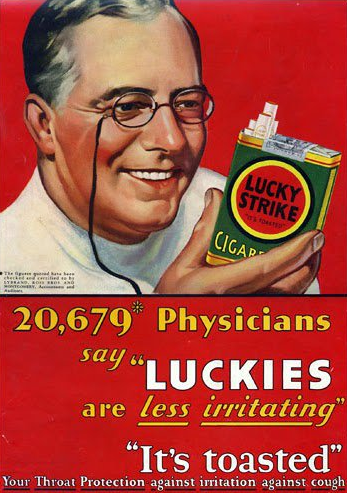 Take cigarette smoking for example; no negative effects were found in the 1950-60’s, and doctors and dentists even recommended them—but now in many countries on every packet the label reads “smoking kills”. I was born in 1952 and as a child in elementary (primary) school saw several children with deformed limbs, which later I learned was due to their mothers taking a drug called “thalidomide”. This was a drug given back in the 50s for the treatment of morning sickness during pregnancy, but quite clearly it was not fully tested before being released as one of the enantiomers8 (either R or S forms of the molecule) resulted in devastating malformation of the foetus, even resulting in death.9 Apparently, worldwide, about 10,000 cases were reported of infants with the same condition, called phocomelia, due to thalidomide, where only about 50% survived. So what’s the message here? Skepticism is sometimes very healthy. It could even save your life. Science without debate is propaganda! Quite often in the cases of slurring of those who would question either the ‘science’ or those promoting an agenda, the Apollo moon landings are brought up, as if those crackpots who believe they were faked by NASA and those who would conceive of such questioning of science, are in the same basket. There is a lot of bait-and-switch and straw man argument going on here. If you say evolution happens, it is disingenuous, because you really mean that natural selection and mutations happen. This is part of operational biological science. But Darwinian goo-to-you evolution does not happen! The climate does change. The science of vaccines is sound, even if at times, as expected in a corrupt world, fraud and mistakes occur. 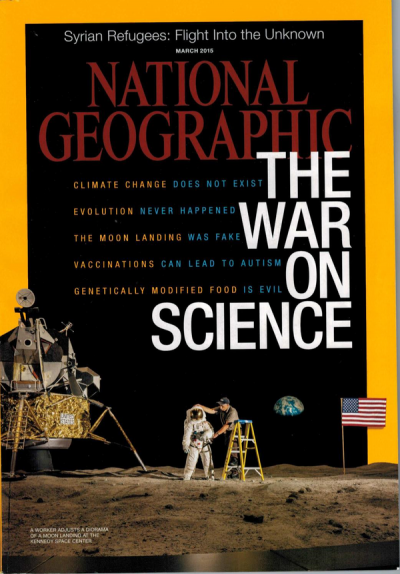 The problem that most people have with each of these topics is not honestly addressed by National Geographic. The article puts up straw man arguments to make anyone questioning the established narrative appear exceptionally irrational, even dangerous. Which, of course, makes no sense at all. He was speaking about circumstantial evidence. In that interview, he even used the analogy of a crime scene, after the crime had occurred. And this highlights the problem. Evolution is not operational science, but historical science, and to answer questions about past events, one really needs access to the past. Science will never provide that. As a professor of physics working in a leading university in Australia, I find it quite paradoxical, when I question the so-called science of evolution, and I use the word now in the widest sense of cosmic evolution. Last year I gave a lecture at my university “8 Reasons Why Evolution is Foolish”11 and after the event I got all sorts of negative comments coming back through my line manager. Apparently geologists and biologists (read ‘evolutionists’) complained to the Dean of the Faculty of Science, that I was even asking questions, let alone criticizing the science, in areas of biology, geology, cosmology etc., and that it looks bad for the university. It only looks bad because I was questioning their religion of science, not operational, experimental science. Isn’t a university supposed to be place where everything is questioned? The main point to note here is that they would censor my questioning! To question ‘the science’ is healthy. In reality this discussion is not about science but about ‘scientism’, the religion of a belief that science can deliver all the answers to not only health and technology, but also to the difficult questions, like: Where did we come from? Who or what made us? How old is the Universe? But these will never be answered by science, because time-travel is impossible and to answer these questions you would need a true and accurate history of the Universe. Where do you get that? I only know one source: the Creator God, who gave us His revelation in the Biblical account in Genesis. The notion that all life on earth naturalistically evolved from some primordial pond-scum over a period of 3.8 billion years, without any Intelligent design, or creation. John G. Hartnett, The coming long dark winter? Virus in the system, The Australian, 28 May 2011. Enantiomers are chiral molecules that are mirror images of one another. John G. Hartnett, The Lecture: 8 Reasons Why Evolution is Foolish. ← Why is Dark Matter everywhere in the cosmos? There is such a thing as “real science”, of course–science that accords with facts (which Evolution, for example, does not). Experimental science is genuine science. It deals with scientific “laws”–i.e. it seeks to discover the regular, predictable behavior of the world in which we live, which is typically described by mathematical formulas, such as F=ma, E=mc2, F=G m1m2/r2, E=hν, etc. Experimental science has produced many useful inventions and technologies, such as automobiles, cell phones, cures for diseases, flights to the moon, etc. Historical events, such as the origin of the universe, or the origin of life, cannot be tested experimentally. They fall in the category of “forensic science”, which requires finding the story that best explains the evidence, with no opportunity to run an experiment to see if the story is actually true. However, the story should be able to make predictions, and this provides a limited way to test such stories. A story that makes false predictions can be rejected, whereas a story that makes correct predictions is at least a plausible explanation. Real science serves a ministerial, not magisterial role. What is popularly called “science” is not science–it is Atheistic Materialism (philosophy) used as an interpretive grid to explain the raw data. When raw data is interpreted through an Atheistic or Materialistic framework, it typically does not fit well, and then scientists trip all over themselves trying to explain how the facts could fit their materialistic dogmas. This is why, for example, Big Bang advocates appeal to a hypothetical “inflationary period” which has never been observed, for which they can give no plausible reason what could have started it or what could have stopped it, and why, after the inflation was finished, the universe is so finely balanced that it neither collapsed back on itself, nor expanded into the reaches of space so fast that stars and galaxies could not form. Likewise, they call upon ad hoc explanations such as “dark matter” and “dark energy”–things for which they have no direct evidence–to explain why billion-year-old galaxies still have a spiral shape, or why the expansion rate of the universe appears to be accelerating. They simply gloss over or ignore the real problem of missing transitional fossils, and seem to think that skeletons could somehow lie around for thousands of years exposed to weathering without decomposing until they eventually got covered with sediment and turned into the billions of well-preserved fossils that occur worldwide. When raw facts are interpreted through a Biblical framework, they fit perfectly. The global flood provides the sudden, rapid sedimentation that explains why fossils are so perfectly preserved, and how rock layers could be folded like taffy. The Bible says that God created discrete “kinds” of animals, which explains the observed absence of transitional fossils. In short, because the Bible was authored by God who actually witnessed (and effected) the creation of the universe and of life, it provides the correct interpretive grid to make sense of the raw data. The success of the Biblical framework is a testimony that it is what it claims to be, and what Jesus and the apostles understood it to be–namely, the written, inerrant Word of God. People that Tim agrees with (though his position as put forward in his blogs is more nuanced) – such as ‘Answers in Genesis’ – insist that their ‘young’ Earth beliefs are ‘creation science’ and they also proclaim that they ‘love science’. I strongly question their claims. They don’t seem to welcome me doing so. And I will also try to post it under the new Hartnett blog (which sounds strangely familiar even though it is new) where to be fair he does not routinely censor me. If the language is civil and the arguments presented against legitimate questions and not ad hominem then how can I censor you considering that that is the subject of my post. Science without debate is propaganda. It cuts both ways. I removed your comment because you started with ad hominem attack on me. Just because you do not agree with my statements does not imply I am lying. That is the language that is unnecessary and unhelpful. On the point you make, concentrations that should be consistent with ages larger than 62,000 years are routinely detected, but assigned as background contamination, most likely due to the belief in a particular worldview. See CARBON-14 IN DIAMONDS NOT REFUTED. “I removed your comment because you started with ad hominem attack on me. Just because you do not agree with my statements does not imply I am lying.” Please could you identify – by showing the opening two or three and closing two or three words – the post of mine you are referring to and which you failed or removed. In any case, a person may sincerely believe that their blatantly incorrect information is correct (because of a religious worldview). If my offending post accused you of that, I am sure that I would have backed up my point as well as making any ‘ad hominem attack’. I do apologise. I only assumed it must have been an ad hominem. I actually don’t know which comment(s) it is(was) you are referring to. But, in future, whether or not you back up the point you are making or not, if it includes ad hominem attack(s) I will delete it. You too have a religious worldview, we all do. Data can be presented but it is always interpreted and the interpretation passes through a worldview (like a narrow bandpass filter). None of us are immune to that. SO—WHAT ELSE IS NEW????? 😀 MAN–I DO MEAN CONTROLLING MEN–LIKE POWER, LIKE Lucifer DOES! John Hartnett, do you believe that no one should be convicted of a crime unless the police, a prosecutor, a judge, and a jury witness the crime while it’s happening? Investigating something that occurred 5 minutes ago, or 5 hours ago, or 5 days ago, or 5 years ago, or 500 million years ago, or 5 billion years ago would all be “historical science” according to you, right? Can you show, via only “observational science”, that the so-called biblical god exists and that it created the universe? That is right it is historical science, or forensic science, which, outside of an eye-witness, relies solely on circumstantial evidence, which I think I made clear. If I didn’t, then let me say that my meaning is that it is only circumstantial evidence that science can deal with on past events. Science can be used to provide support for what might have happened in the past but it cannot observe what happened. Science is all done in the present and then a story is assembled just like in a crime scene investigation. Some lines of argument may be excluded, contrary to the data, but multiple models/theories explaining the same one-off past events, like the origin of life or the origin of the universe, are possible. Then the worldview of researcher influences how he interprets the evidence, even what he accepts as evidence. And on your last question: No I can’t. The exact same constraints are imposed on any origin event, regardless of our worldview, or religious position. That is true of all past events, and hence it should be acknowledged that science has become a new religion, because it now claims to answer those fundamental questions. John, are you saying that you and an atheist would see the “circumstantial evidence” presented in a court trial differently because you and an atheist have different ‘worldviews’? Do you believe that you and other christians would always see the “circumstantial evidence” presented in court trials or in scientific studies the same way because you are christians? If science will “never provide that” (answers to questions about past events) then how can science provide support for what might have happened in the past and build models/theories (whether multiple or single) explaining one-off past events or any other past events? If science will “never” provide answers about past events, what will? If someone you really care about were murdered and there were no witnesses, would you tell the police and prosecutor to not bother to investigate and prosecute because all there could be is ‘historical, circumstantial evidence’? If someone were on trial for allegedly committing a murder and there were alleged witnesses to the murder, would you expect the police, the prosecutor, the judge, and the jury to automatically believe the alleged witnesses or would you expect there to be forensic (scientific) studies done on the ‘historical, circumstantial evidence’ to make sure that it was a murder and that it occurred as the alleged witnesses claim it did? Are alleged witnesses always right? Do people ever lie, make things up, or embellish what they claim to have observed? What if you were the one on trial for murder and you knew that you are innocent but some alleged witnesses claim that you did it? Wouldn’t you really, really want and expect to have forensic (scientific) studies done on the ‘historical, circumstantial evidence’ to show that the alleged witnesses are wrong? And wouldn’t you really, really want and expect to have the alleged witnesses’ testimony scientifically analyzed to make sure that they’re telling the truth and that what they claim to have observed is what actually occurred? Which would you rather bet your life on, alleged witnesses or scientific evidence of past events? In your physics work, have you ever relied on and promoted “circumstantial evidence” that pertains to past events? In all of the papers and books you’ve written and in all of the lectures you’ve presented do you always say that you could be or are wrong because you have a literalist christian YEC worldview, and that you rely on “circumstantial evidence” and “models/theories” about past events that are wrong? After all, since science will “never” answer questions about past events, all science, models, theories, and alleged evidence pertaining to past events will “never” be correct, eh? You obviously firmly believe and you promote that the universe is only 6,000 years old and that it was created by your chosen, so-called god. Were you there when it was allegedly created by your chosen, so-called god? How do you know that the universe wasn’t created by much longer ago by Zeus, or Shiva, or Ra, or a slimy blob from the 57th dimension, or that the universe didn’t come about naturally without a so-called god? According to your claims, you can only rely on what you are able to observe as it is occurring, and anything that has already occurred is historical, circumstantial, and therefor worthless as evidence, right? Of course you can believe in whatever you like but when you claim that science will never answer questions about past events, don’t be surprised that you’ll run into strong resistance. Firstly on // “circumstantial evidence” presented in a court trial //: Forensic evidence in a court trial is sometimes misinterpreted because of the bias or worldview of the researcher. The parallel to origins research is there but of course not exactly the same. But DNA evidence at a crime scene is by definition circumstantial and on occasions it has been ‘planted’ so it in itself is not irrefutable in all cases. But if the plaintiffs DNA is not a match to that found most often it is presented as evidence of their innocence. Yet such a conclusion is based on a worldview. In this case the belief that the DNA has not been planted to throw off the investigation. Secondly, I am really applying this to past unobserved events when discussing, for example, origin of life or goo-to-you type evolution. Regardless of our worldviews the evidence is the same but our worldview is the framework into which we insert that evidence to what the researcher believes is the best interpretation. On the point you make about my statement “… one really needs access to the past. Science will never provide that” what I have said is not contradictory. ‘Access to the past’ means to observe the past, to be able to test an hypothesis in the past. This we can do in a laboratory experiment, repeatably, in the present, but we cannot do that on some past event. The evidence we have is all in the present. Nevertheless, science can accumulate evidence, circumstantial evidence that you can weigh one way or another, but you will never have a definitive test because as I have said we have ‘no access to the past.’ So yes, in contrast to a laboratory experiment that can provide a repeatable test and hence an answer to a scientific question, science cannot provide that about a past event. See Operational and Historical Science: What are they? I do not say that circumstantial evidence obtained by forensic science does not have a role. I already said it did in my previous response. But it is by definition circumstantial. Yes, I agree eye-witnesses do lie and for that reason in a serious criminal trial the balance of probability test of guilt is raised to a much higher level than in a civil case. I think in a murder trial all (i.e. unanimous) jurors must form a “belief” that the evidence is best “interpreted” as the plaintiff committing the act. The whole rationale behind judges coaching jurors on “no reasonable doubt” is because the court recognises that the jurors cannot know absolutely. But I think you know all this already. In terms of research in my lab, no historical science ever is involved. Similarly with any biological research in labs no evolutionary goo-to-you assumptions need to be made. On occasions they have been to the detriment of the research, only because it delayed a line of investigation. For example, “Junk” DNA was the name assigned to all those so-called non-coding DNA sequences, which were considered leftovers of evolutionary dead-ends or failures, i.e. junk. But as it now turns out that was totally wrong and those codons etc have function. The code is much more complex than once imagined (currently 6 dimensional I believe) and the so-called “Junk” is very important indeed. On your last point, yes, I admit I believe in the Biblical Creator the great I AM of the Bible. I have no scientific evidence for His existence, but neither does an atheist have any for His non-existence. This is why we have different worldviews. We accept certain things on faith everyday. If we didn’t we could not function. No, I do not reject all circumstantial historical evidence as worthless. On the contrary, I accept it all, but the interpretation is what we will disagree on. The Bible has a record of historical evidence, which I am sure we disagree on. Here is a short synopsis of what I believe. There is a significant difference between a court trial and the way secular scientists conduct their research. Secularists insist that it is not valid to appeal to a deity as an explanation for how the universe came into existence, or how life began. This prejudices the investigation from the outset. Imagine, in a murder trial, that the mayor was actually the murderer, but the judge instructs the prosecuting attorney that he is not allowed to implicate the mayor. It wouldn’t matter how clever the attorney is at uncovering facts if he is not at liberty to consider the one explanation that is actually true. In the end, the court would end up convicting the wrong person for the crime–if they convicted anyone at all! If God actually is the Creator of the universe and of life, then scientists are engaging in futility or deception if they are forbidden to consider this as a viable option. They will be “… always learning and never able to arrive at a knowledge of the truth.” (2 Timothy 3:7). As the apostle says, they “… suppress the truth.” (Romans 1:18). Perhaps you can provide the scientific explanation for dust-to-man creation then, using your special un-biased research technique? Or better yet, perhaps, using any science you like, provide some actual evidence for the existence of your preferred ancient middle-eastern tribal deity? Biblical creationist do not make the claim that science can provide the evidence you ask for. Science cannot directly observe the past. I do not claim a scientific explanation for my belief. To answer such questions both you and I look to a faith position, a worldview, into which we insert the circumstantial evidence we find. So we are both religious in that sense only that we have different ‘beliefs’ on origins. It’s quite interesting that the Large Hadron Collider (which sought as I understand it to replicate conditions believed to have occurred seconds after the theorised Big Bang – something YECs believe never happened) was successful in discovering a previously unseen sub-atomic particle – the Higgs Boson. But maybe it was sheer good luck or chance, and nothing to do with the veracity or otherwise of the Big Bang theory (which of course relates to the obviously unseen distant past though is based in part on the observed rapid expansion of the universe)? The discovery of the Higgs boson has been very important for particle physics but it also has presented a big problem for the big bang inflationary epoch. See INFLATION—ALL IN THE ‘DARK’. Based on the physics of the Higgs potential that is now allowable due to the LHC discovery the universe should not exist. My main point earlier was that the LHC sought to replicate what scientists think happen in the distant past, and it and the scientists interpreting its results have not failed to make any new discoveries. Yes, it would seem that they have been thrown a fortuitous reprieve now that those BICEP2 data are ruled out. See NEW STUDY CONFIRMS BICEP2 DETECTION OF COSMIC INFLATION WRONG. I agree with you in as much as the LHC team has not failed in a prediction. I would say though that the BICEP2 team failed in a detection of the claimed era of inflation via a prediction of its concomitant primordial gravitational wave spectrum now that its discovery is retracted. I am sure they live in hope of better data that can be separated from the spoiling effects of the cosmic dust emissions in the Galaxy. No doubt this is not the end of this.